The DTR340 is a diode array detector. In association with the EMR LED light emitter, it is able to detect the weld hole made in order to locate the linking weld between two strips. The Weld Hole Detector DTR340 consists of a lens, a linear diode array, and a processing unit. ¨The Emitter EMR consist of an array of high power red LED. Adjustable mounting stand (2 axes). In case the sensor needs to be replaced, it can be easily dismounted from the stand, thus keeping the alignment. Control panel beneath a hinged cover at rear. The DTR sensor detects the light emitted by an EMR through the weld hole. Sensor and emitter are fixed perpendicular to the line axis in order to take the lateral deviation of the strip into account. The DTR field of view and the emission of the EMR emitter should completely cover the lateral position of the hole. The EMR emitter should cover the field of view of the DTR sensor. 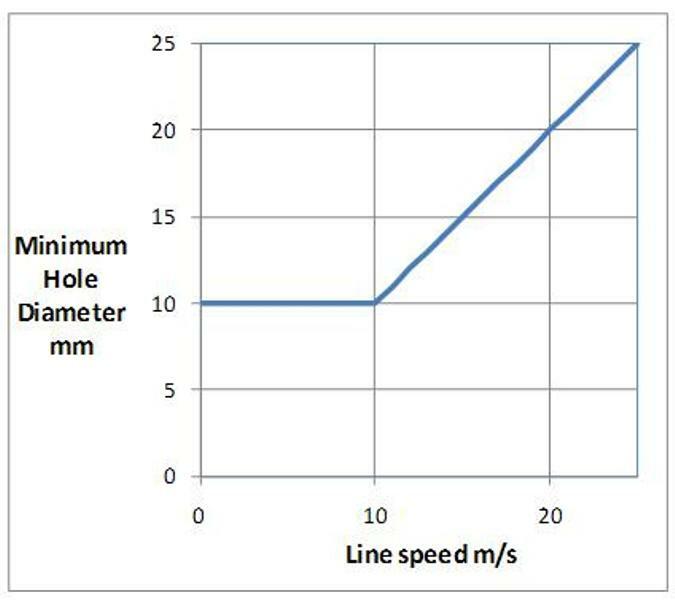 The minimum hole diameter depending on the line speed is define in the graph below.